I first came to the Folger as a high school freshman participating in the Secondary School Shakespeare Festival. I was playing Dogberry, the lovable constable with a penchant for malapropism, in my high school Shakespeare Club’s abbreviated staging of Much Ado About Nothing. My first Festival was incredible – the extreme energy and love for Shakespeare I found there were only matched by the equally thrilling second and third Festivals I attended. I was hooked. 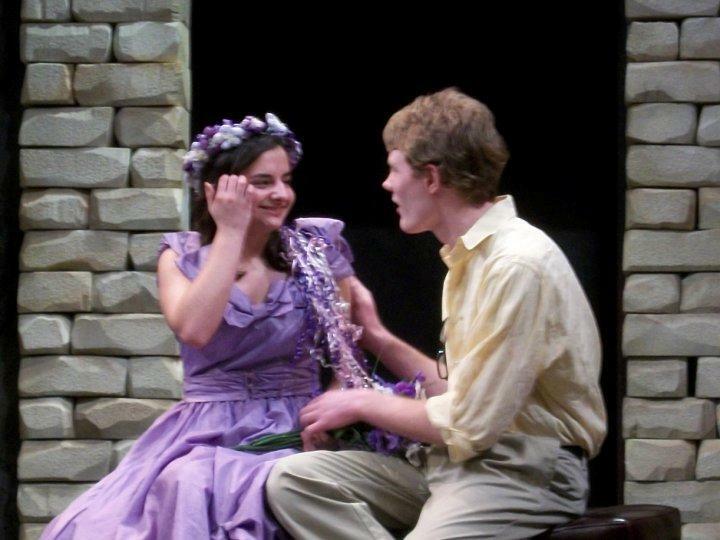 Here’s a photo from the 2010 Secondary School Shakespeare Festival at the Folger – I’m playing Perdita, with my friend Ethan as Florizel, in The Winter’s Tale. Having loved the Festivals, I wanted to see if I could get more out of the wonderful resource that is Folger Education. During the fall semester of my senior year of high school, I was accepted to the Folger’s High School Fellowship Program. Twice a week for three months, fifteen fellow students of Shakespeare from around the DC metropolitan area and I got to take advantage of all the Folger had to offer – seeing the Folger’s production of Othello (and chatting with its director, Robert Richmond), discussing Much Ado About Nothing with Folger Director Dr. Michael Witmore, and touring the Folger’s Reading Room were just some of the program’s highlights. After going to the Festivals and participating in the Fellowship, I knew that I wanted to learn more from the Folger and became a summer intern for the Education Division. This is my second summer working with Education, where every day is unique. Generally, I’ve helped to plan curriculum for Shakespeare for a New Generation and develop the script for the acting ensemble Bill’s Buddies, which has taught me fun various ways to bring Shakespeare into the classroom. Another major benefit to interning at the Folger is the constant opportunity to learn. Between last summer’s Teaching Shakespeare Institute and this summer’s Conference on Teaching Shakespeare in the Elementary Classroom, there seems to be an endless stream of guest lecturers and entertaining workshops to enjoy. To any students in the DC metropolitan area, I definitely recommend checking out what the Folger has to offer. Even if you’re not sure how you feel about Shakespeare now, try coming to a Secondary School Festival to see if your mind might change; if you know you’re a die-hard fan, apply to the High School Fellowship Program or the poetry seminar Shakespeare’s Sisters. As for me, I’m not sure what I’ll end up doing as a career – I’m toying with majoring in English, Education, or some combination thereof – but I know that I want to stay connected to the Folger, and I’m excited for whatever the rest of my summer with Education may have in store!